If your kitchen is anything like mine, it has a constant imbalance of egg whites to egg yolks. Being an avid egg white-omlet-eater, I am always left with a surplus of yolks. A few mornings ago, while my veggies and whites were setting up, I rinsed yet another 3 yolks down the drain of the kitchen sink. I got to thinking- I’ve been eating approximately 3 egg whites for breakfast 4 times per week for about the last 4 years. 624 whites per year X 4 years = the fact that I have wasted 2496 egg yolks in my lifetime!!!!! And, that’s not accounting for the times in my life that I have used whites to make meringue cookies, angel food cake, or rub in my hair because I read an article in Seventeen that persuaded me to. Something’s gotta give here. I can’t be wasting all these yolks when 13.6% of the world lives in hunger! Then again, it’s not like I can donate egg yolks at the local food bank along with non-perishable canned goods or next day air them to starving children in Africa. 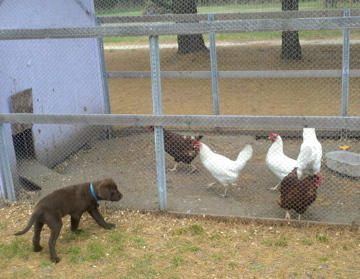 I’d feed them to Tide but he has had an aggression towards our chickens since the day we brought him home at 8 weeks old and I don’t want to perpetuate this fetish of his any further. In order to rid myself of the guilt associated with wasting these perfectly fine, fresh, farm-raised egg yolks, I must begin putting them to good use. I began thinking of dishes that use only the yolks as an ingredient. First up is this Banana Cream Pie. This pie came out wonderfully smooth, creamy, and delightful. 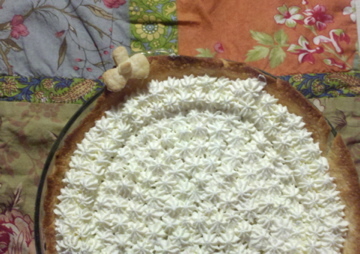 I made whipped cream and piped it on top with a star tip, but you could also use cool whip or meringue, if you prefer. Next, I’m thinking about making creme brulee , followed by homemade mayonnaise, pastry cream, lemon curd, hollandaise sauce, and a variety of custards and puddings- all dishes that use up leftover egg yolks. Although, first I should probably ask my doctor for a prescription for some type of statin. With all this added cholesterol it wouldn’t hurt to serve my guests a little souffle dish of Lipitor alongside. In a small bowl slightly beat the egg yolks. In a saucepan, over medium/high heat, heat the milk so it just comes to a boil, stirring frequently. Whisk in the sugar, flour, and insides of the vanilla bean and continue cooking, whisking constantly until mixture thickens (about 3-4 minutes.) Pour a small amount of the hot milk mixture into the bowl of egg yolks and stir until just combined. Then, immediately pour this mixture back into the saucepan of thickened milk. Continue cooking, whisking constantly for about 1-2 minutes. Remove from heat, stir in the butter and let cool for about 15-20 minutes. Slice bananas and arrange them around in the bottom of the pie crust. Pour mixture overtop. Refrigerate til cold. Top with whipped cream.